Recently I wrote a post on the book The Hunger Games, and in particular the way in which the motif of ‘grain’ as a strategy of control and ‘bread’ as a tactic of subversion recalls the use of grain by Rome and use of bread by the Christian community within that world of ‘bread and circuses.’ In Panem, the Capitol controls the distribution of grain to the 12 Districts as both carrot and stick; and the Districts each make their own forms of bread, in distinctive shapes that reflect their primary employment and with regionally-available additional ingredients, so carrying their own identity in a way the Capitol cannot crush. Moreover, bread is used as gift, a way of sharing meagre resources to ensure that the Capitol does not crush someone else: it is the ultimate symbol of solidarity, of refusing to put oneself before another. In the film version, this motif (along with most of what makes the book interesting and disturbing) is largely lost. Bread combines the lives of the two boys who are in love with Katniss – without her being aware in either case – when, near the start of the film, Gale offers Katniss a small loaf sold to him by Peeta’s father, the baker, which she breaks in two and shares with him. But the act is easily overlooked, in a scene which struggles to convey a gesture of unconditional love being returned with a gesture of conditional friendship. The significant moment when Peeta provided Katniss with bread recurs in flashback several times; but its story-telling power as testimony to the depth and length of his love is almost entirely negated by setting it in the very recent past rather than some years before, not long after her father’s death, when Katniss, her mother and sister were close to starving. There is a moment in the film where grain – used by the Capitol as a strategy of control – is directly appropriated as a tactic of subversion; a moment we do not see in the book, told as it is from Katniss’ perspective, trapped in the Games arena. When she shows solidarity with another District, honouring Rue’s life and death by placing flowers around her body and signing respect to the girl’s community forced to watch on a big screen, a riot ensues in District 11 in which the trappings of the Capitol are targeted and grain silos are opened with the grain, pouring out, becoming a means of obstructing the ‘peacekeepers’ and even a weapon to crush and drown them. Further reflections on conversations with Mark Carey. As noted in my previous post, discipleship is relational, directive, and involves both being a disciple (being led, or following) and making disciples (leading, and being followed). This post is concerned with the stages of leading, and the styles appropriate to each stage, as we seek to lead according to the pattern of Jesus. The first stage of leadership is an apostolic phase. Its focus is casting vision. The primary work is setting out revelation (this is what we are going to do) and the restraint (what we are not going to do) that comes with revelation (without revelation, restraint is cast off, and the potential for momentum dissipates). The second stage of leadership is a pastor/teacher phase. Its focus is embedding values. The primary work is encouraging those who have responded to the first-stage vision to stay within the restraints established then, coaching them in the core values of the vision. So, for example, if hospitality is a core value, we model what hospitality looks and feels like, in our context, with gradually increasing teaching following experience. The third stage of leadership is an evangelistic phase. Its focus is shared vocabulary. By ‘evangelist’ I mean someone who, by natural preference, cannot help but communicate good news stories; and by evangelistic phase I mean taking on this discipline whether it is our natural preference or not. In this stage of leadership, Jesus sends his disciples out to do the things he has been doing. They can be entrusted with this because they have a shared understanding, a common ‘vocabulary’ for describing the in-breaking kingdom of heaven. But they return to Jesus as the one who gathers-up their good news reports. The primary work of third stage leadership is passing-on the good news stories concerning those we lead: no longer telling our stories, but telling theirs; the leader as collector and distributor. So, for example, by the third stage of transitioning a church to missional communities, a key role for the bigger gatherings is telling the stories of the pilot communities. The fourth stage of leadership is a prophetic phase. Its focus is releasing vehicles, as one community of disciples multiples. The primary work is supporting those you have led (your disciples) to develop their own vision (that they will cast, becoming first-stage leaders) as they listen to what God is putting on their hearts, ensuring that the necessary ‘cover’ (or structure for ongoing accountability) is in place for them as your own relationship with them changes from day-to-day discipler to more removed mentor or overseer (Jesus leaves his disciples, but sends the Holy Spirit). Note: the question of providing the right cover for those leaders we release is one that, to date, the fresh expressions and pioneer ministry movements have not adequately engaged with; it is also the key element of fourth-stage leadership that, in failing to put it in place, led to the most costly relationship breakdown with people we had led Jo and I have experienced. It is important to go through the stages – not in a mechanistic sense, but not attempting to short-circuit the process Jesus models. Short-cuts (such as attempting consensus decisions from the outset) result in the people we lead having a vehicle for discipleship without understanding the values that drive discipleship (akin to a car without an engine – which is an expensive box), and this leads to problems that undermine the whole process of discipleship. Short-term gain ends in long-term loss. Which stage of leadership is most suited to your natural preferences? From whom can you learn (be discipled by) how to grow in competence within your strengths? From whom might you learn (be discipled by) how to grow in competence in those stages/styles that lie further outside of your comfort zone? Jesus models a life-on-life relationship of invitation (“come and spend time with me”) and challenge (the call to repent of an earth-bound perspective on life and believe a kingdom-of-heaven perspective). Paul models the same approach, inviting others into relationship, and challenging them to imitate him as he imitates Christ. Discipleship is relational...contrary to the belief that Jesus disciples us directly through the Holy Spirit (Jesus explicitly charges disciples with the responsibility of making disciples); or that we can be discipled remotely by Christian authors (they can be helpful to us, undoubtedly, but it isn’t discipleship – not least because they cannot engage us in discussion or hold us accountable, essential ingredients in the difference between passing on information and handing on transformation); or that we can deliver discipleship through packaged courses. Genuine discipleship consistently points the disciple to Jesus, not through abstract ideas, but through embodied evidence of transformation – imperfect yes, but real life examples. The good news (the invitation here) is that we all have relationships, and that you don’t need to be an expert. The challenge is to make some of our relationships intentionally discipleship relationships. Again, this is because discipleship is concerned with handing on transformation, not passing on information (which can be passed on in other ways). The key questions of discipleship are: what has the discipler learnt, that the disciple needs to learn at this moment? and, how might the thing that the discipler has learnt be applied in the life of the disciple? This second question is important for two reasons: firstly, because we are not concerned with the acquisition of knowledge (what to believe) but with the application of wisdom (how to believe); and secondly, because the outworking of the same wisdom will look different in two different lives. The implication of discipleship – disciples who go and make disciples who go and make disciples – is that it is not a peer relationship, not a mutual discipling of one another (however valid mutual edification is). In over-prioritising mutual edification, we have effectively contained the momentum of discipleship (rather than one discipling a few, each of whom disciple a few, we tend to gather in groups that ‘disciple’ one another within the contained group, or to seek – potentially conflicting – investment for ourselves from several other voices at once). Discipleship is directive: it is about being led, about following, and about learning to lead, to call others to follow. Andrew was John the Baptist’s disciple before becoming Jesus’ disciple: I would suggest that Andrew and John were not simply filling time, but that John took Andrew as far as he could – teaching what he had learnt, pointing (literally) to Jesus – at which point someone else (in this case, literally Jesus) took over the role of his discipler – a relationship which lasted three years, before the nature of that relationship, too, moved on. Likewise, I would suggest that our expectation should be that we learn from someone who is sharing their life with us, and that we invite a few people at a time into our lives to learn from us...and that both the person who is discipling us, and the people we are discipling, will change from time to time as we each in turn journey through the process of becoming disciples who make disciples (a process that moves from unconscious incompetence in any given aspect of our lives, through conscious incompetence and conscious competence, to unconscious competence). You can’t make disciples outside of the parameters you have been discipled in (again, not least because all you can do is pass on information rather than hand on transformation)...and you can’t be a disciple unless you are learning to make disciples (that is, you are not the end product or point of this process). Who is discipling you? Who has discipled you in the past? Who are you inviting into your life, to disciple? The amazing French mechanical marionette street theatre company Royal De Luxe has been in Liverpool over the weekend, as part of the centenary events marking the sinking of the Titanic (the Titanic was registered in Liverpool, and many of her crew came from the city). Over three days, their giants walked around Liverpool in an unfolding story inspired by a real little girl who wrote a letter to her father, a crew member on the ship, telling him how much she missed him. He never received the letter – the Titanic having sailed from Southampton before it could be delivered – but in Royal De Luxe’s magical tale ‘Sea Odyssey : Giant Spectacular’ her uncle walked the seabed for a century to bring back the ship’s postal crate and the father’s reply, before an emotional reunion. We took the train in to the city to see them yesterday, and it really was...spectacular. The crews operating the Little Girl, her dog, and the towering Diver were mesmerising – especially the pairs jumping off the Diver’s rigging and running round to jump off again, in a conveyor-belt of motion that powered him forward. The teamwork involved was quite simply absolutely inspiring. I’ve added a set of photos on my flickr account. I’ve just read ‘The Hunger Games,’ the first part in The Hunger Games trilogy. and that if we are to engage in Christ-centred mission to my children’s peers, we need to enter-into the stories they are told and tell, affirming the fragments, and building bridges from the testimony they carry to Jesus. Earlier this week we watched a fascinating programme, ‘Meet the Romans with Mary Beard’ (BBC2, part 1 of 3; Mary Beard is Professor of Classics and Fellow of Newnham College, Cambridge University). 2000 years ago the population of Rome exploded, doubling in size and doubling in size again, becoming a city of 1 million people, a city larger than any Europe had ever known, or would know again until Victorian London. Rome was not a place you came from, but a place you came to; and, more than that, an idea people were drawn to, from all over the ancient world. Anyone from anywhere could become a citizen of Rome. It even became a common practice for slaves to be given the money to buy themselves citizenship at the completion of their contracted service, if indeed they had not saved the sum already from out of their wages. It struck me that the Romans – by which I mean the people who lived in Rome itself – were incredibly tolerant of anyone from anywhere; as long as they were willing to be assimilated into the Roman way of doing things. But – quite understandably, given how the city’s life depended on surfing the very edge of chaos – the Roman ‘idea’ or ‘genius’ was firmly (and when deemed necessary, violently) intolerant of anyone from anywhere who resisted assimilation: which is why both the Jewish and the Christian population experienced the unwanted attention of expulsions and persecutions from time to time. Almost all of the population lived in the new high-rise apartment blocks (insula, a Roman architectural development), separated – for the first time in history – from the means of growing even some of their own food. The emperor bestowed upon every Roman citizen, rich or poor, a monthly grain dole. Some 200,000 received the dole, which was enough grain for bread for two people for a month. In this way, a sizeable proportion of the population were appealed to – in much the same way as our own politicians appeal to different groups within our society – and the rest had an incentive to aspire to citizenship. As insula accommodation was predominantly one-room apartments without even kitchen facilities, let alone land, most people relied on professional bakers to turn their grain into tear-and-share bread for them. More than that, this is a classic example of de Certeau’s observation of strategies of control and tactics of subversion. Many of the Christians were themselves Roman citizens. They took the emperor’s strategy of control – the grain dole he bestowed – and employed a tactic of subversion – using the very grain to create the very symbol that refuted the power play at work. This causes me to wonder how subversive Communion is in my own context. Does breaking bread retain any subversive creativity at all? Or has it, ironically, become a strategy of control, a means of reinforcing the status quo (to borrow a Latin phrase from the Romans)? How might we reclaim Communion as a tactic of subversion, within the State, and within the Established Church? Moreover, do we view that which the State bestows on us as our right, that to which we are entitled; that which we must fight to retain for ourselves, in the context of national, regional and civic budget cuts? Or might we view what we are given as raw material that can be refashioned into the statement “Jesus is our Lord, who provides for us” as we share one another’s burdens and meet one another’s needs in ways that do not absolve the State of responsibility but undermine its position as false god we have entered into co-dependent benefactor-beholden contract with? What do you do when your life hasn’t turned out the way you thought, the way you hoped? What do you do when you find yourself in circumstances, day-after-day, that you would not have chosen, that you did not think you had signed-up for? What do you do when life is...death? That would be the place we find Jesus’ first disciples in John 20; and not only when Jesus was dead, but also when the risen Jesus appears to them and sends them into the world as – in the same manner, the same pattern, the same mission - the Father sent him. That would be the place anyone who sets out to be a disciple finds themselves, sooner or later. In just these circumstances, Jesus extends invitation and challenge to his disciples. Alongside invitation, Jesus extends challenge. The challenge to go, to be sent after the model of Jesus (v21): to be sent to die to self, to take up our cross and follow him, in order that God might bring life to others. That life we didn’t think we had signed-up for...we had. The challenge to forgive...and to not forgive sins (v23)? What is that about? I don’t think it is about withholding forgiveness, but about God’s forgiveness being exercised through Jesus’ disciples; about God’s commitment to partnership with his people; about our responsibility to set people free, because if we don’t, they remain bound. Sometimes we are wounded simply by circumstances, and sometimes our wounds are self-inflicted, but often we are wounded by other people – or come to believe that we have been wounded by other people, even if we were wounded by circumstances or by ourselves. Because wounds are inevitable, exercising forgiveness is essential: to loose the chains on others (rather than add to them), and to free ourselves from our own chains. Finally, the challenge to stop doubting and believe (v27). By ‘stop doubting,’ Jesus isn’t saying we can’t ask questions, isn’t saying we should suppress unanswered questions with denial. Denial is never healthy: that is why Jesus does not hide the wounds that have been inflicted on him. That which we struggle to believe, we need to bring out into the open – again, in a safe place, with trustworthy people – in order that doubt might die and belief have life breathed into it. It is doubt that is denial: the whispering voice of the accuser telling us that death is the final word, that God will not bring new life out of our present circumstances. In the hard times, we need those who will hold out hope. Not candy-floss and kittens, but flesh-and-blood bearing-the-scars Jesus-in-our-midst changing our whole perspective. Because we do not see him in the physical sense he was seen between his resurrection and ascension, we need to help one another observe his presence, which may not be immediately recognised; to reflect on his woundedness, and discuss the implications for our own wounded lives. We need to help one another to ‘have life in his name’ (v31), forming a plan to live out that (resurrection) life in our present circumstances, however bleak; and holding one another to account in our response, so that we act in a way consistent to our confession. He invites them to see, to touch, even to enter-into his woundedness (John 20:20 and 27). For even his resurrection body bears the wounds of his crucifixion; they may be healed, but they are not erased. They are a part of his story, his testimony to the faithfulness of the Father, who did not deliver him from death (avoidance) but through death and out the other side (victory). They are a key part of his story. And our wounds are a key part of our story, our testimony. Indeed, if we have no wounds, we have no share in Jesus’ story. In the place where we are being wounded, the (self-inflicted as well as inflicted by others) wounds we have received in the past are a testimony to us of God’s (forgiveness and) faithfulness. The way we bear our wounds – not hiding or denying them; not keeping them to ourselves (to fester, to feed resentment and anger) but being vulnerable before others and inviting them in, even knowing that they might further hurt us – is a testimony to others of God’s faithfulness. Jesus also invites them to receive the Holy Spirit (v22). He literally breathes God’s life into their bodies, animating what would otherwise essentially be dust. He invites them into a covenant exchange: God’s life at work in and through them (which also comes with a challenge). And, of course, the invitation to receive, to enter-into, to live out of a place of peace (vv19, 21, 26). Note that having spoken peace to the disciples, the next time Jesus appears to them he speaks peace again. Note that, having received the Holy Spirit and been sent (John’s account does not share the chronology of Luke-Acts), the disciples are once again in the locked room. It would appear that peace is not a one-off gift, but something we need to have spoken into our lives over and over. And that, too, is worth knowing when life is not as we had hoped. That we need a safe place, and people with whom we share experience, to return to and be sent out from, to have peace (reconciliation, with God, one another, and those to whom we are sent) ministered to our hearts. At times, we might need to be able to return to that locked room, that safe place, on a regular basis: not to stay there, but to visit often. Jesus made disciples, and sent them to make disciples who would in turn make disciples. This is the way of life we are called to. and that, from out of that group he calls specific people who he will focus investment in, people who are shown him by his Father as he prays about who to invite. This would seem to me to be the model Jesus gives us. But Jesus is clearly very at home in social gatherings, is clearly the sort of person to whom others are drawn; and I am an introvert. Not only that, but I know that I am not alone! So how do we navigate the first stage of discipleship as introverts? Not everyone is drawn to extraverts. Indeed, some people are repelled by extraverts. There will always be people who are drawn to introverts – and not only other introverts – but this will almost certainly be a slower process and a smaller number of people than will gather to extraverts in general and certainly to apostles who are, among other things, natural people-gatherers. And if this is our only model, we will be frustrated! Certainly, we have found that it takes a long time to see people respond to our repeated invitations to share our lives with them (my wife is not an introvert, but having been married to me for so long has made her more attuned to introvert preferences); but also that the few who do have often (though not always) become very committed friends. Starting with a smaller group of people to choose from, I think there is a temptation to hope to invest meaningfully in each of these people. Experience tells me that this is a mistake, and one that sets us up for disappointment. Indeed, it has been those people where I have had a very clear sense of God’s voice saying “I have sent this person to you” that have proven to be the most lasting relationships. Throughout this initial, perhaps speculative or at least preparatory stage, we have modelled those values that are core to us: values that include hospitality, and service; values that have marked every community we have nurtured. Over the years, the number of people who have responded has been relatively few; but, we have seen those who God has given us to disciple reproduce those values, in a host of diverse expressions, all over the world. And again, this is what we see modelled by Jesus, who, though he drew large crowds, invested in a few, and in so doing touched – and continues to touch and to transform – the whole world. Today in the Church Calendar is the commemoration of Dietrich Bonhoeffer, the Lutheran Pastor who was executed by the Nazis on this day in 1945. Bonhoeffer was a prophetic voice in a dark time, and continues to inspire those who are called to call the church to repent and believe, to forsake the false comfort of nostalgic patterns to take hold of that for which Christ has taken hold of us. I am thinking, how do we commemorate a life? I believe we best commemorate a life not by enfolding it within those very nostalgic patterns, but by identifying something in that life that we choose to imitate. And by imitate I do not mean slavishly attempt to copy – we are called to grow into ourselves, not into someone else’s calling – but to ask, what would that look like for me? Recently, Jo and I, along with our good friend Mark Carey, have been reflecting on what we experienced, and he observed, in Sheffield when Mike Breen was Rector at St Thomas.’ Mike lived by the apostle Paul’s pattern, “imitate me as I imitate Christ.” Mike called people to join his team, and he and Sally invested their lives in us. We were regular guests in their home. I was part of a group of people who Mike met with on a weekly basis – and Jo was part of a similar group Sally called together – and week by week they would share with us what God was showing them. Week by week, we were brought to Jesus; and we saw the difference that Jesus made in our lives, we watched transformation take place in the lives of others. In time, we were challenged to go and do likewise, to invite people into our lives, to bring them to Jesus. Not that we were completely Christ-like by any means – and neither were Mike and sally – but because this was Christ’s model, investing in a certain group of people, making disciples who in turn would make disciples. Since we have left Sheffield, we have not experienced anywhere else what we experienced there. In college placements and curacies we have experienced vicars who chair business meetings, but not that sharing of life, not that bringing their team to Jesus. Our observation is that it isn’t even on the radar: not for church leaders, and not the expectation of church members. What has this to do with imitation? Well, we are convinced that we are called to imitate what we saw in Mike and Sally, as they imitated what they saw in Jesus. We are convinced that we are called to call people into life-on-life relationship, and in that context to bring them to Jesus, over and over again; and to challenge them to do likewise. We are convinced that this is how it should be. But, I am not Mike; and Jo is not Sally; and we are not in Sheffield. Mike is an apostle. He is larger-than-life. He is someone to whom people are easily drawn, to whom people gather. Mike and Sally are both big-hearted people, and in Sheffield they were able to throw their home open to lots of young adults who were asking questions about life, and looking for something other than just the bubble that student life can be. I am a prophet, intense, introvert. My tutor at college summed it up well when he wrote that the more he got to know me, the more he appreciated me, the more he recognised of real value in me: but it wasn’t (and is never going to be) something up-front and out there. In some ways, people have to work quite hard to get to know me. And in part, that is something I have to work to bridge; but in part that is simply me. So it takes time for people to be drawn to us – and for the time being we are in a season of moving every two years! The way an apostle will lead a team will be different from the way a prophet leads a team; will be different from the way an evangelist or a pastor or a teacher leads a team. But teams do not simply exist by bringing people together: they are built, and they are built through a process (we call it the Square). At different times, at different stages in the process of building a team of disciples, we are required to lead them in different ways. At least some of the time, we will be operating outside – perhaps well outside – of our comfort zone (and these are the times when we are stretched most, when we go deeper into Jesus). I may not be an apostle, but if I am to call people to follow me as I follow Jesus – if I am to model a particular culture, to instil particular values we might cohere around so that as we move forward we don’t pull apart – then I must allow the Holy Spirit to draw me into an apostolic phase. Just as an apostle will need to allow the Holy Spirit to draw them into a pastoral and/or teaching phase when the going gets hard and those who have gathered are questioning their decision; just as we are, perhaps (thanks, Mark, for these suggestions), led into an evangelistic phase as we send our disciples out to find their own People of Peace; and, perhaps, a prophetic phase as we release them to pioneer the territory God has called them to chart so that new communities of faith can be established. While I am not called to copy Mike, I did get to observe him for years. There are things I can learn from him – some things that are transferable and some things that are translatable – that can help me to operate in apostolic phases, even if they are never going to come naturally to me. While I am not called to copy Bonhoeffer, I am invited to commemorate his life: exploring with God what I might learn from him and how I might apply those things in my own life. So now that Easter is over...Oh, wait: Easter lasts forty days to Ascension Day, and then a further nine days to the eve of Pentecost. Why? Because it takes time to live into resurrection: chronos time, setting aside seven weeks; and kairos time, encountering the risen Jesus. And if the church looks more like a museum, or a mausoleum, or a waiting-room for heaven, than a pilot project for the human race then that is an unsurprising consequence of doing Easter in a day, and of making it about what Jesus did for us as individuals rather than what he has done for and to all creation within which I am not the centre of the universe. If Christ is risen from the dead, then every barrier is broken down. But we have loved our defensive walls, our elaborate socio-architectural structures, our clear divisions and classifications; we have loved to fight our corner, to determine who is chosen and who is side-lined; we have loved our petty triumphs, and our scapegoats for our failures. And if we are to delight in those who do not look like us, if we are to rejoice to see them flourish, if we are to revel in the unity-in-diversity that God has championed since the very first chapter of our Story, it is going to take time. In a garden, the serpent swallowed the woman first, and then the man. 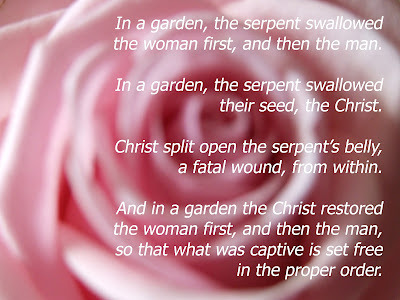 In a garden, the serpent swallowed their seed, the Christ. Christ split open the serpent’s belly, a fatal wound, from within. And in a garden the Christ restored the woman first, and then the man, so that what was captive is set free in the proper order. I left everything to follow him, and now he is dead. And at the end, I denied knowing him. My testimony denied my own existence, who I became. He was the structure and the content of my days. Now structure, content, days themselves are lost to me, and I to them. My firstborn son is dead. I have already lost the man who sheltered me, who raised my son as his own; have already released his hands, so gentle and so strong, to the grave. It is with the deepest sorrow that we must inform you of a death in the family. 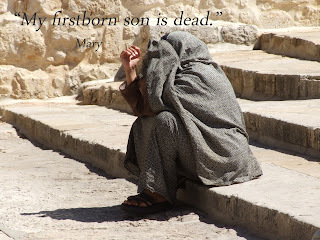 Jesus, the Son and heir, died yesterday, in violent circumstances. His voice has fallen silent; the dynamic Word now still. His chair at our table, lightly empty since he left home, is now heavy with the weight of emptiness. We would ask all our friends to gather at our house early tomorrow, to pay your respects. Thank you. There is an old Pentecostal sermon-in-a-sentence, “It’s Friday, but Sunday’s coming!” And there is some truth in that...but the problem with some truth is that it inoculates us against full-blown truth. Don’t rush from Good Friday to Easter Day. Don’t miss Saturday. It is easy to dismiss Saturday, because we know What Happens Next; but Sunday does not wipe out Saturday. For Jesus’ first disciples, Saturday was living with the death of all their hopes and dreams. We might say that that was only because their hopes and dreams were misplaced, that they didn’t match God’s hopes and dreams: but we’d be wrong. Yes, their expectations might not have matched God’s, but their hopes and dreams and God’s were focused on Jesus, and Jesus was dead. At the level of chronos, chronological time, Saturday was momentary. 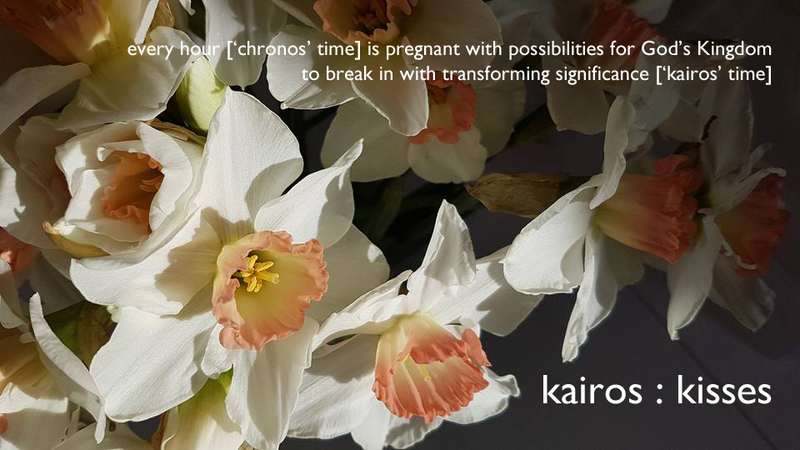 At the level of kairos, experiential time, we cannot imagine how long it dragged on for. We, too, will have hopes and dreams – God-given hopes and dreams – that lie dead. And the Story of how God acts to reconcile all things does not violate that death. Rather, Jesus comes to lie there next to us, to be one with us in our deaths, that we might become one with him in his life. These things are mystery, too deep for words. But if we ignore Saturday, then Easter is hollow and trite. So may we all have a most disturbing weekend, because the world is not transformed through platitudes but by the deep, rich Story of the Truth who comes to set us free. Noah and I have made a very simple Good Friday installation in the south transept, for the final Hour at the Cross this afternoon. He lay down to provide the template, and I formed the outline using red electrical tape (left over from wrapping around Christingles, to represent Jesus' blood). We marked the wounds of Jesus with little tape crosses together.